A Palestinian minor succumbed to his wounds, late Tuesday after he was shot and critically wounded by Israeli live ammunition during protests in the eastern Gaza Strip. 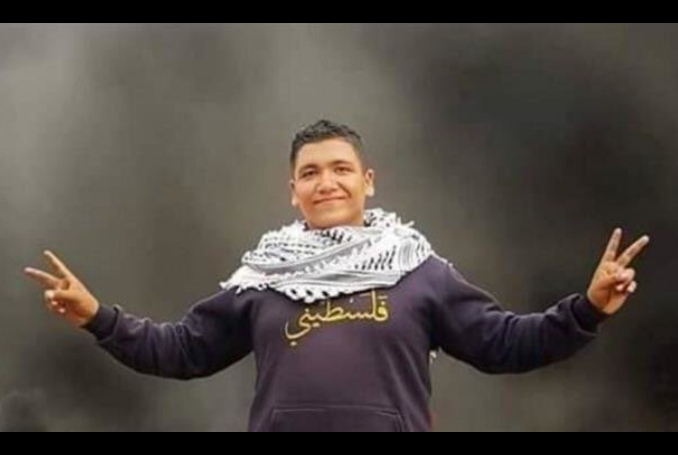 The Palestinian Ministry of Health in Gaza confirmed that 17-year-old Muntaser Ismail al-Baz was shot and wounded in the head by Israeli forces during protests near the fence separating Israel from the besieged Strip, east of Deir al-Balah. The ministry said that al-Baz was transferred to the al-Shifa Hospital, where he had succumbed to his wounds shortly after. Seventeen-year-old Montaser Mohamed Ismail al-Baz, a Palestinian teenager on Tuesday succumbed to wounds he sustained from Israeli army gunfire during rallies near the buffer zone between Gaza and Israel, the Palestinian Health Ministry said. “The Great March of Return” protests were launched on March 30 by thousands of Palestinian civilians in Gaza — which has suffered from over a decade-long Israeli siege — who took to the borders to demand their right of return as refugees to their original homelands, now in present-day Israel. Be the first to comment on "Palestinian Minor shot, Killed by Israeli Forces in Gaza #Palestine #GroupPalestine #israelTerrorists #boycottIsrael"